Alex Garland’s visionary, unsettling “Annihilation” doesn’t fall into the same neat categories as so many recent films in what has been a sci-fi genre boom of late. Whether it’s the big films like “Blade Runner 2049” or the Netflix ones like “Mute” and “The Cloverfield Paradox,” sci-fi is everywhere in the late ‘10s, with most of it owing a great deal to some combination of Stanley Kubrick’s “2001,” Ridley Scott’s “Blade Runner,” and the Wachowskis’ “The Matrix.” Even within this resurgence, rarely do you see a film that’s built from the templates of Tarkovsky films like “Solaris” or “Stalker,” movies that used sci-fi in a discomfiting, emotional register because, well, that kind of filmmaking is incredibly difficult to pull off. It’s so difficult in fact that Paramount had no idea what to do when they saw “Annihilation,” barely promoting it, holding it from press until a few days before release, and selling it to Netflix for international markets. Maybe they’re still burned by the failure of “mother!,” but they’re burying a genre gem here, an ambitious, challenging piece of work that people will be dissecting for years. Don’t miss it. What looks like a meteor hits a lighthouse in the opening shots of “Annihilation.” Flash forward, we presume, to a woman being interrogated by a man in a hazmat suit. People watch the interrogation through glass and wear protective masks even though they’re not in the same room with her. Who is this woman? Why is everyone treating her like a biohazard? Flash back, again we presume, to a time before Lena (Natalie Portman) was possibly radioactive. A successful biologist, Lena seems just about ready to get over the grief of her missing husband—who has been gone on a covert mission for a year and presumed KIA—when he walks up the stairs and into her bedroom. Kane (Oscar Isaac) may be home, but there’s a sense immediately that something is wrong. In a quick flashback, Garland shows us a playful, smiling Kane, so we the viewers can sense along with Lena that something is not right with the dead-eyed man in front of her. Garland is brilliant in the way he parcels out information with a quick scene, line, flashback, etc.—giving us just what we need to process and analyze the action in front of us while also staying one step ahead of us, making us eager to catch up. Then Kane starts spitting up blood. Before long, Lena is brought to a place called the Southern Reach, a research facility a few miles from that lighthouse in the opening shot. On the horizon, near a tree line, she sees what can best be described as a rainbow wall. Dr. Ventress (Jennifer Jason Leigh) informs her that it’s called ‘The Shimmer,’ and that they have been investigating it for three years now. Past The Shimmer, no radio signals have returned, and no manned missions have produced a survivor … until her husband. The assumption is that something in there kills people or people go crazy and kill each other. Lena, Dr. Ventress, and three others—tough-talking Anya (Gina Rodriguez), shy Josie (Tessa Thompson), and sweet Cass (Tuva Novotny)—will venture into The Shimmer, get to the lighthouse, and return. Maybe. If you’re wondering how much has been spoiled at this point in the review, the answer is almost nothing. “Annihilation” really becomes itself once the team crosses that threshold into the woods, a fascinating setting for a sci-fi flick that reveals itself slowly. This is not an alien planet, and yet there’s a sense of danger and some sort of biological aberration within these woods. Garland reveals just enough at every turn to keep us confused but also in the moment with Lena and the crew. It’s a film that balances disorientation with the grounded performances of its cast, who keep us engaged in each interaction, believing the danger as it unfolds. “Annihilation” could have easily become campy or silly. If I described some of its scarier scenes, you might laugh, but Garland finds a way to make the insanity work, and watching that balancing act can be invigorating. There are times when the structure of “Annihilation” frustrated me just a little bit (although I’m eager to see it again to see if that complaint fades away)—flashbacks within flashbacks often do that—and I’m not sure Garland’s final act works as well as it could have. 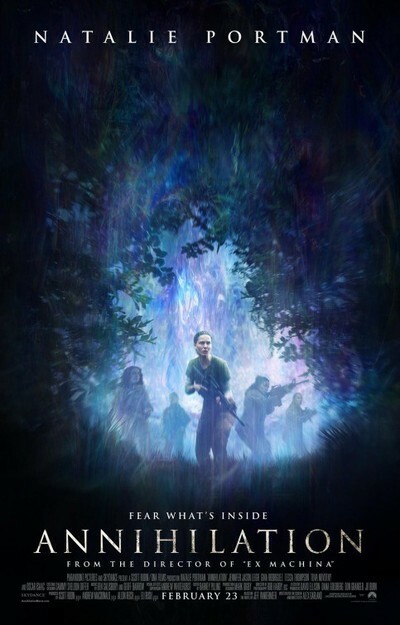 There’s an inherent problem with mission films like “Annihilation” in that the journey is almost always more engaging and interesting than the destination. Questions make for better art than answers. However, Garland leaves enough open for discussion that he saves it artistically. And he produces some of his most striking visuals in those closing scenes. “Annihilation” is not an easy film to discuss. It’s a movie that will have a different meaning to different viewers who are willing to engage with it. It’s about self-destruction, evolution, biology, co-dependence, and that which scares us the most—that we can no longer trust our own bodies. It's meant to linger in your mind and haunt your dreams. In this recent wave of sci-fi films, it's one of the best.